The Sri Sathya Sai Institute of Higher Learning has stood tall as an edifice of excellence in Education and Educare for the past three decades now. It is a sapling that the Divine Gardener planted with His own hands (Yes! Swami placed the first few bricks of its foundation and poured cement with His own Divine hands) and today it has grown into a mighty tree, sheltering thousands of students and through them, many more thousands everywhere. It was a special day on March 13 and it came as a surprise to everyone in the hall. 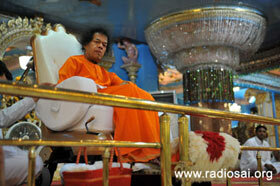 Swami arrived for darshan at 6:15 p.m. He took a complete round in the car and even as He went around, He tossed vibhuti packets to a few lucky ones. The car stopped in the portico and Swami arrived on the stage. 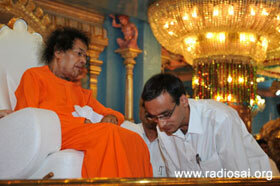 The bhajans were on and Swami sat listening to them. He tossed three vibhuti packets for a student in the front and later followed it up with tossing four to another student to keep one for himself and distribute the rest to three singers in the front. After a short while, the Vice Chancellor was called to the stage. 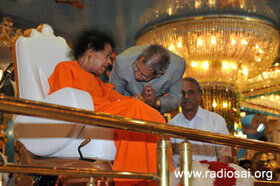 Swami instructed him to make the announcements. Everyone seated in the hall were actually wondering what was going on when the mike and podium were brought. A tray covered in pink silk was presented to Swami and He opened it and examined the fountain pens placed there. Prof. Anil Kumar was summoned and the announcement commenced. Twelve students from the Sri Sathya Sai Institute of Higher Learning have been cleared for Junior Research Fellowships by the CSIR, Council of Scientific Industrial Research, after they came out with flying colours in the National Level Eligibility Test (NET) conducted by the apex body, the UGC - the University Grants Commission. These students belonged to the departments of physics, chemistry, mathematics and bio-science. Another student who has cleared NET for MBAs was also felicitated. As Prof. Anil Kumar called out their names, these students came on stage one after another to receive the 'priceless' gift from the Divine Chancellor. 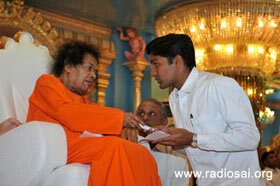 Swami’s pride was seen in the sparkle that showed in His eyes as He lovingly gifted the pens to each of these students. Some of them had a letter for Him and He accepted it and began to read it there itself. It was a beautiful moment and the students could not have asked for greater glory, honor and joy than to receive appreciation and accolades from the Divine Himself. Once the ceremony was over, bhajans continued and there was renewed enthusiasm and energy. 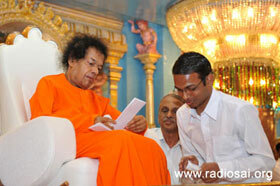 It was 7:10 p.m. when Swami signaled for aarthi. 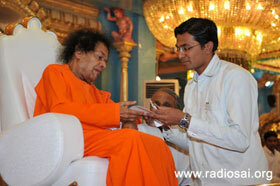 He then blessed prasadam to be distributed to all. After this, blessing the whole assembly, Swami retired for the day.